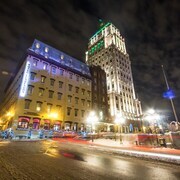 This Beauport hotel is within 7 km (5 mi) of Montmorency Falls and the Plains of Abraham, and a 10-minute drive from Old Quebec. 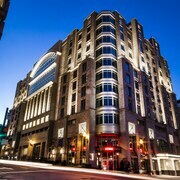 Steps from Old Quebec and connected to the convention center by underground passage, this green hotel offers an ideal downtown location. Staff went out of their way to help. Very friendly. Where to find La Durantaye hotels near an airport? Where can I find hotels in La Durantaye that are near tourist attractions? Looking for an apartment or hotel within a short driving distance of central La Durantaye? Within easy driving distance from central La Durantaye you'll find 3 Expedia-recommended lodging options you can choose from. There are a range of Expedia hotels within driving distance, such as the Chalets Plage St-Jean 1 and Chalets Plage St-Jean 2. The Au Domaine des Neiges is situated 25 kilometres (16 miles) from the middle of La Durantaye. Another option is the Chateau Mont Sainte Anne, which can be found 25 kilometres (17 miles) away. Two other Expedia-listed accommodation options include the Auberge La Grange de l'Ile and the Hébergement Mont-Sainte-Anne. 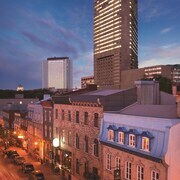 If you have time left, you could explore the other scenic and cultural delights of Chaudiere-Appalaches. 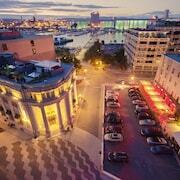 Visit Chaudiere-Appalaches' old towns. Those with a hankering for wide open spaces and fresh air should also make the time to to admire the region's beaches, forests and rivers. Tourists in this region of Canada commonly enjoy snowboarding and skiing. The closest hotels in Montmagny are Saint Jean Port Joli and L'Islet. Saint Jean Port Joli is 60 kilometres (39 miles) to the northeast of La Durantaye, while L'Islet is 50 kilometres (31 miles) to the northeast. Accommodations in Saint Jean Port Joli are the Motel 414 and Motel La Seigneurie. While accommodation options include the Studios Vacances Marchant de Bonne Heure and Gîte les pieds dans l'eau B&B. Before you say goodbye to Montmagny, why not make sure you experience some sport. Visit PEPS to the west of La Durantaye. For tourists who are interested in staying close by, make a reservation in the Le Bonne Entente or Holiday Inn Express Quebec City - Sainte Foy. Located 40 kilometres (26 miles) from La Durantaye is Jean Lesage International Airport. 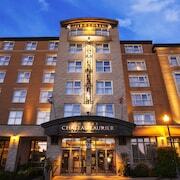 Stay nearby at Grand Times Hotel Quebec City Airport or Comfort Inn Airport East- Ancienne Lorette. What are the most popular La Durantaye hotels? Are there hotels in other cities near La Durantaye? What other types of accommodations are available in La Durantaye? 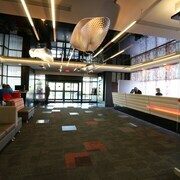 Explore La Durantaye with Expedia.ca’s Travel Guides to find the best flights, cars, holiday packages and more!